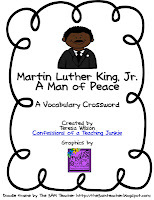 I am working on my MLK unit for this week and just made this crossword freebie. Click on the image to download your copy! What are you planning for your lessons this week? It's a Mid Winter Mad Money Giveaway! Writing Resoulutions and What's Ahead in 2013? Currently and a Shout Out Linky!